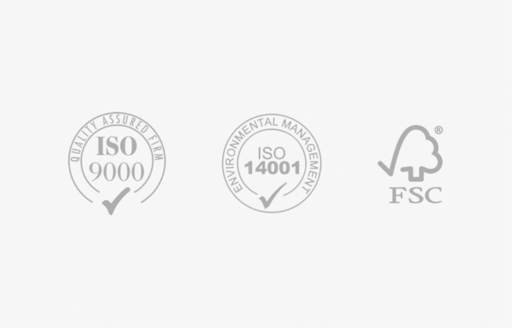 Drisag is ISO 9001:2015 and ISO 14001:2015 certified. In the coming years, Drisag wishes to develop into the most inspiring consultant and solid producer of “your workplace experience” by working with a team of people realising all encompassing solutions. We think we can achieve the things mentioned above because we find great satisfaction in trying to meet and exceed the expectations of our clients by means of cooperation, internally as well as externally. In addition, we do this in a profitable manner with respect for our environment. We consider a well-functioning quality system and environmental management system a prerequisite for the realisation of the above. Reliability: We wish to come across as an organisation that keeps its promises. The expectations of our customers are our starting point. Our promises have been considered and aligned, both internally and externally, so that we just exceed the expectations of our customers. Speed and completeness at delivery: We wish to carry out our deliveries quickly and completely so that the disruption to the customer is minimal. Professional advice: The customer receives professional advice from us. To this end, we employ specialised staff who receive continuous internal and external training. Ergonomics: When developing new products, we take into account the latest state of affairs in the field of ergonomics. We develop our products in accordance with the current ergonomic standards. Reliability: We also want our products to meet the current standards in terms of operational reliability. Ecology: When developing new products, we base ourselves as much as possible on environmentally friendly production processes. In addition we want to only use sustainable materials in our products where recyclability has been taken into account. Drisag’s management is committed to creating the conditions for its employees to meet the above quality and environmental criteria.